CityScape Phoenix is a development in the downtown Phoenix core with retail, restaurants and entertainment. It is located basically where Patriot's Park used to be, for those that remember that open area in the downtown business district. 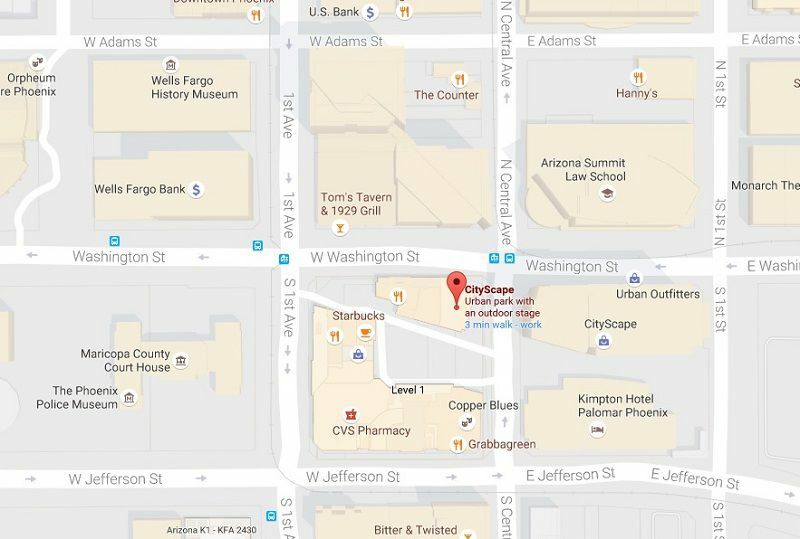 CityScape is located in downtown Phoenix, AZ near Symphony Hall and the Talking Stick Resort Arena (formerly known as US Airways Center). It is within walking distance from the Orpheum Theatre, the Comerica Theatre, and Chase Field. CityScape's entertainment venues include Stand Up Live and Lucky Strike. Kimpton's Palomar Hotel Phoenix is part of the CityScape complex. These hotels are located in Downtown Phoenix. The Palomar Phoenix Hotel is located right at CityScape (see reviews and check availability at Palomar Phoenix Hotel on TripAdvisor). The major cross streets are Washington/Jefferson Streets between 1st Street and 1st Avenue. Central Avenue splits CityScape down the middle. Note that Washington is a one-way street going west and Jefferson is one-way going east. From North Phoenix/Scottsdale: Take the Piestewa Peak Parkway (SR 51) south to I-10. Exit at 7th Avenue and turn (south). Drive to Jefferson and turn left (east). Drive to Central Avenue. From East Valley: Take I-60 west to Interstate 10 west. Exit at Washington Street and turn left (west). Drive to Central Avenue. From West/Southwest Phoenix: I-10 East to 7th Avenue. Turn right (south) to Jefferson and turn left (east). Drive to Central Avenue. From Northwest Phoenix/Glendale: Take I-17 south to Jefferson Street. Turn left (east) on Jefferson Street to Central Avenue. See driving times and distances from other Phoenix area cities and towns to Phoenix. Use the Central/Washington or 1st Avenue/Jefferson station. This is a split station, so which station depends on which direction you are going. Here is a map of the METRO light rail stations. To see a larger image of the map above, simply temporarily increase the font size on your screen. If you are using a PC, the keystroke to us is the Ctrl + (the Ctrl key and the plus sign). On a MAC, it's Command+.